Attic apartment located right by the beach of La Barrosa, in Chiclana de la Frontera (Cádiz), just a few steps from the front door and you will be on the sand. Situated in a quiet area, but just five minutes away from the area where the bars and restaurants are to be found. 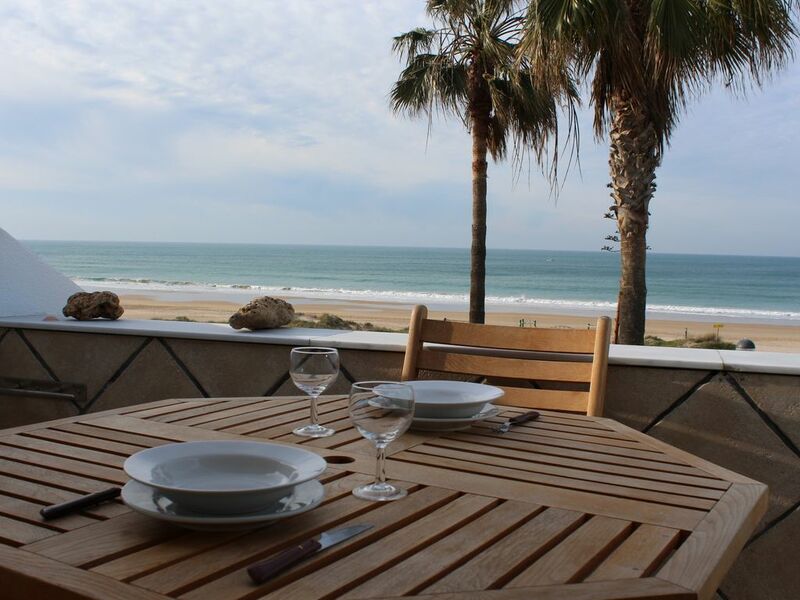 The fantastic views from the terrace look out to sea across the whole of Barrosa beach. The apartment is small and cosy. The maximum capacity is for four people, but it´s ideal for two. The roof is sloping and the sharpest angle is in the bedrooms. It has three bedrooms, one with a double bed and the other rooms with one single bed each. The lounge joins on to the American kitchen which has a vitroceramic hob, microwave, fridge freezer and all utensils that you may need. The bathroom has a shower and there is a utility room for the washing machine. Air conditioning is a bonus for the hot summer months and Wi-fi is included. The apartment next door has the same owner and features so the two can be rented together for families or friends who wish to holiday together. Die Lage der Ferienwohnung ist super! Die Wohnung ist kleiner als sie auf den Bildern scheint. In den Schlafzimmern kann man stellenweise nicht aufrecht stehen. Die Wohnung ist mit allen notwendigen Dingen ausgestattet, aufgrund der räumlichen Enge hat man aber nicht wirklich Lust in der Wohnung zu kochen. Der große Vorteil der Wohnung ist die Lage!! Nur ein paar Minuten zum Strand und abends die Sonnenuntergänge vom Balkon genießen! La ubicación es genial. Muy cerca de la playa. Hay todo lo necesario para pasar unos días de descanso. La playa inmejorable!! La cama de las habitaciones individuales son pequeñas para personas altas. Al estar entre paredes no permiten sacar los pies por abajo.